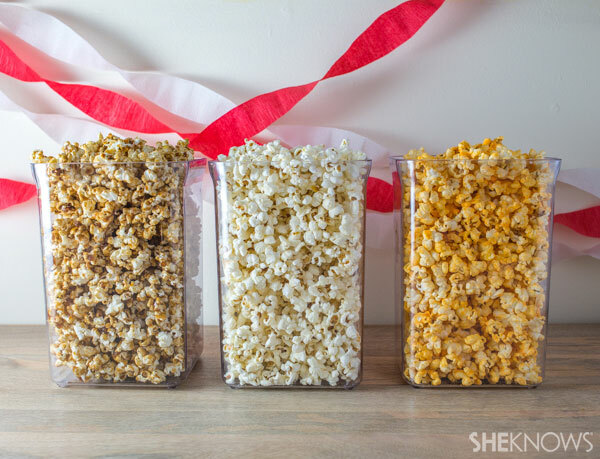 While the grown-ups are watching the football game, keep the kids engaged in this fun activity — making a custom popcorn buffet! 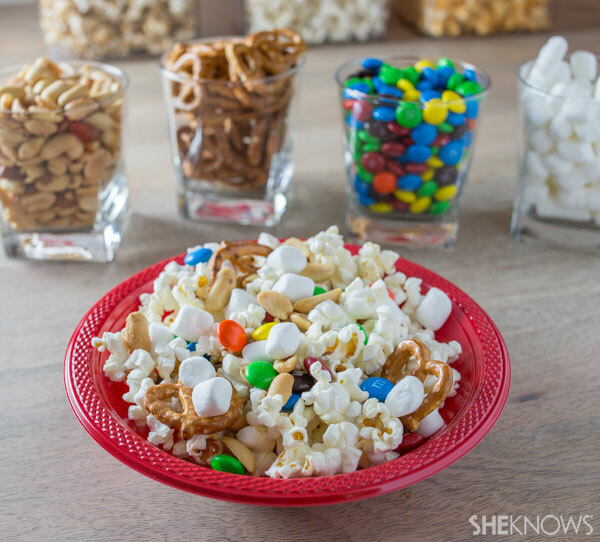 While all eyes are on the big game, this build-your-own popcorn bar is an engaging, tasty and affordable activity for the kids. With its visual appeal and sweet-and-salty draw, don’t be surprised if some of the grown-ups make their way over to the buffet, too! 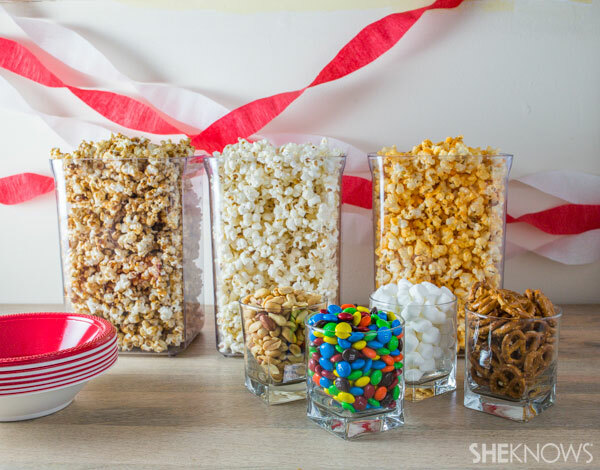 All you need to set up your own popcorn buffet are serving vessels for the popcorn and mix-ins, individual serving vessels for each child to make his or her own popcorn creation and, of course, the popcorn and any other treats you choose. To serve the popcorn, any large bowl or jar will do. Matching or similarly themed containers look nice, but the kids won’t care what they look like! The same goes for the individual servings. You can purchase cute vintage popcorn boxes (Amazon, $4 per 8-pack), or you can do as we did and pick up some paper or plastic bowls. Add the coconut oil to a large pot over medium-high heat. Once the oil has melted, add 3 of the popcorn kernels and cover with a lid. When at least 1 of the kernels pops, add the remaining popcorn kernels and cover again, this time with the lid slightly ajar. Give the pot a little shake so all the kernels become coated in the oil. When the newly added kernels start to pop, shake the pot frequently while keeping the lid ajar so the steam escapes. When the popping begins to slow to more than 1 second between each pop, pour the popcorn into a large bowl. Sprinkle it with the salt and give the bowl a shake to distribute the salt. Cheddar cheese powder can be found in specialty stores and online, but you can also get it quickly by using the packets included in boxed macaroni and cheese. Melt the butter in a small saucepan over medium heat. Add the popcorn to a very large bowl so you have room to stir — work in batches if your largest bowl is not big enough for this. Drizzle the melted butter over the popcorn while tossing to evenly distribute the butter. Immediately sprinkle the cheese, continuing to toss so the popcorn is evenly coated. This recipe is adapted from this crunchy and sweet caramel corn recipe. The ratio of caramel to popcorn is decreased, resulting in a less decadent treat — but a treat nonetheless. Line a large baking sheet with parchment paper. Add the popcorn to a very large bowl so you have room to stir — work in batches if your largest bowl is not big enough for this. Add the butter to a medium saucepan over medium heat. Once the butter is melted, stir in the brown sugar. Once the brown sugar has melted, increase the heat to medium-high to bring the mixture to a boil. Use a candy thermometer to determine when the caramel reaches 235 degrees F, then remove the pan from the heat. 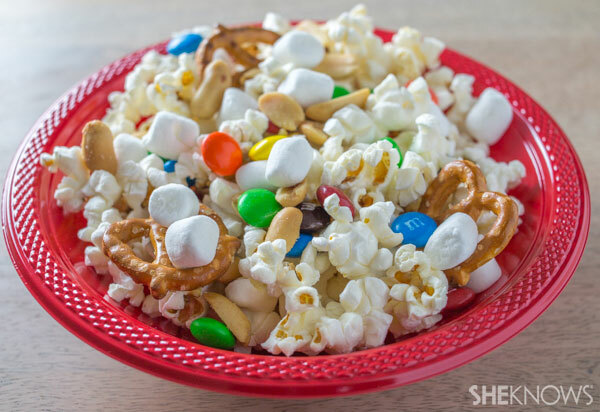 Drizzle the caramel over the popcorn while tossing the popcorn to evenly coat it. Pour the caramel corn onto the prepared baking sheet and allow the caramel corn to cool. Break it into pieces before serving.